I was spending a month in Oregon (in an off-grid community of mud huts and organic food) when the fires began raging in Sonoma, Napa, and Mendocino Counties. Driving home to the Bay Area, I put on my N95-rated dust mask in Fairfield (60 miles from Santa Rosa). Following my first reactions about my friends who live there, my thoughts were of the smoke’s contents. Mass-produced building materials, fiberglass, refrigerators, halogenated flame retardants, plastic, roofing. My next thought was, who is putting together the meeting about rebuilding? He and his wife Sarah Weller King threw a small dinner party and got planning. They put together a dedicated committee of about ten people, including the likes of Ann Edminster and Oren Wool, along with scores of others pitching in. What emerged was a day-long event four months later at the Veteran's Building in Santa Rosa. Rebuild Green Expo gathered city planners, designers, home performance contractors, building department officials, natural builders, architects, and a chef. The intention was to share freely of their knowledge, with people affected by the fires. Back in November, I got wind of the event, contacted Bruce King, schmoozed my way onto the guest list with a press pass, feeling proud. But the joke was on me; it turns out the event was free. The event was free. 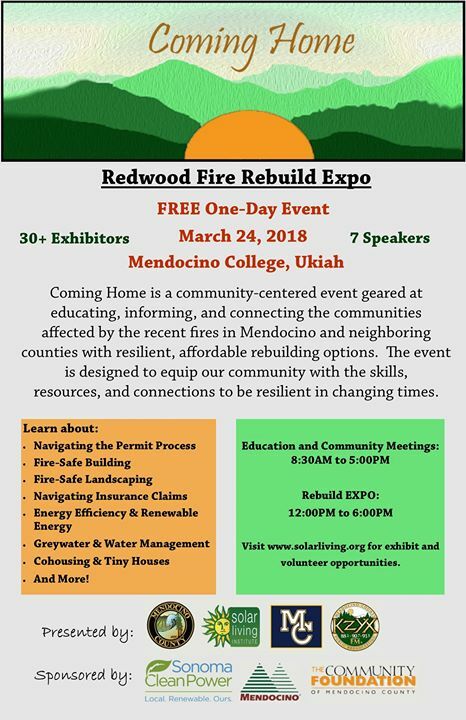 People affected by the fires were invited to come spend the day in educational sessions with experts in sustainable building, chat with experienced architects, ask questions of code officials, and even show their house plans to consultants in an hour-long session, for free. Not just saving hundreds in consulting fees, but learning to ask questions they didn't know they had. Many people I spoke to had no dreams of one day building their own home, but were suddenly thrown into it. They didn't want to build their own house, they had to. The exhibition hall was packed with row on row of tables displaying resources, inspiration, information; and hosted by experts with knowledge, experience, and passion. A chef was stationed inside the hall, demonstrating an induction cooker, enticing the most vegetarian of us with the smell of bacon. He engaged the snobbiest gas-only cooks among us the safety features of an all-electric kitchen. It didn't feel like your typical Trade Show. There was something different going on. Here was a true cross-roads, of the uninitiated, the reluctant owner-builder speaking eye-to-eye with the seasoned professional in a welcoming environment, instead of across a bureaucrat's desk or a building department counter. As in trade shows and conferences, it’s the conversation between presentations that can be the most meaningful. My favorite offering of this event was called the Hacker Session, in which a presenter sat at a table and participants could spend an hour of time with them. Offering up these one-on-one conversations with seasoned pros whose hourly rate is upwards and beyond $300, was an enormous help, and I believe new owner-builders learned to ask question they didn't even know they had. “There is a lot of green building expertise around here, and it was nice to make important ideas more accessible, like efficient framing and heating systems, microgrids and walkable neighborhoods, and the many compelling reasons to go to all-electric homes and neighborhoods. —Leslie Jackson is Associate Editor at Home Energy magazine.